Wow! I saw the Northern Lights! I feel like it’s been on my list, and it was actually kind of surreal actually seeing it. It did take a few tries though. The first night we went on the tour that drives you outside Reykjavik and away from city lights. However, the Northern Lights never really appeared. They have a guarantee though that if you don’t see it, you can rebook and go again for free. The next night, they cancelled the tour though due to weather and visibility. The third night was our last night in Iceland and thankfully the tour was going and conditions looked pretty good. When it started appearing everyone did their “oohs” and “aahs” and it was magnificent. I must say that knowing how to see up the SLR camera was very useful. To the naked eye, it looks a bit more faint and not as colorful. All in all, it was an amazing experience and I was so excited to have seen it!! This would be an absolute dream come true for me. I would love to see the Northern Lights. Thinking about a trip to Iceland next year so fingers crossed! Yes! It was definitely magical! 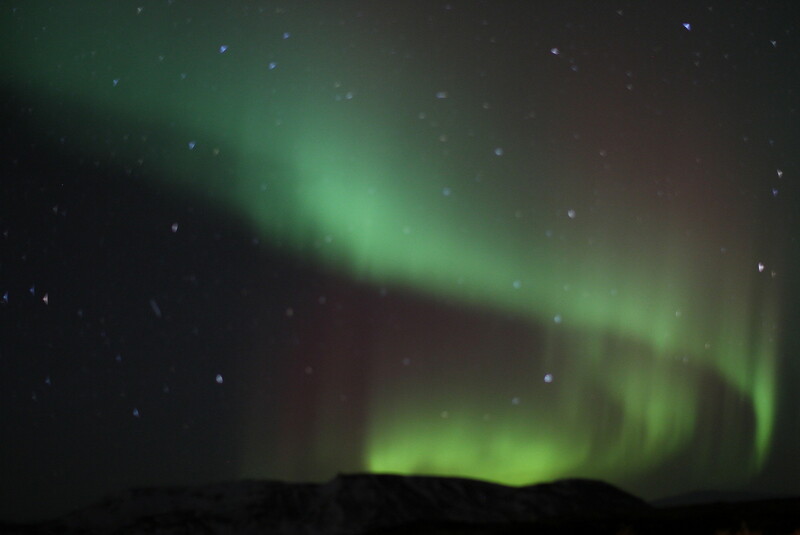 Iceland is a great trip, even when we were worried we might not get to see the Northern Lights! ← [on the road] Goodbye for now, Brighton.